We prepare you with top level understanding of best practices in designing and operating mission-critical infrastructure from a series of high quality CPD courses / training programs and qualifications. Building Industry Consulting Services International (BICSI) (www.bicsi.org) is a professional association supporting the information technology systems (ITS) industry since 1984. ITS covers the spectrum of voice, data, electronic safety & security, project management and audio & video technologies. It encompasses the design, project management and installation of pathways, spaces, optical fiber- and copper-based distribution systems, wireless-based systems and infrastructure that supports the transportation of information and associated signaling between and among communications and information gathering devices. 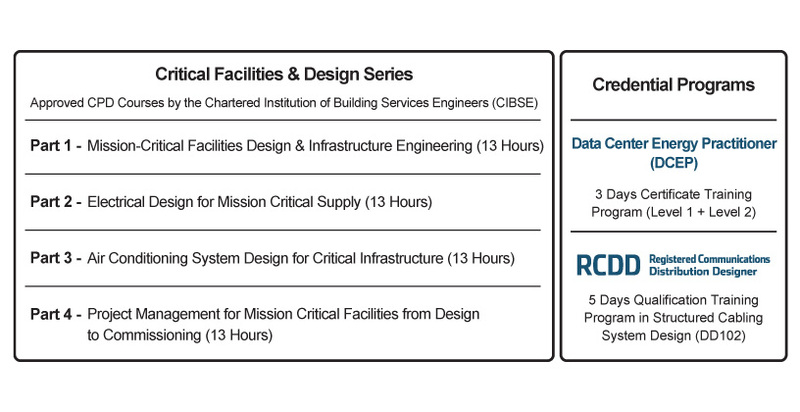 Our instructors, combined with professional Chartered Engineers (CEng) from the Institute of Engineering Technology (IET), the Chartered Institute of Building Services Engineers (CIBSE), the American Society of Heating, Refrigerating and Air-conditioning Engineers (ASHRAE) and the Hong Kong Institution of Engineers (HKIE), have more than 10 years experience in data centre design & build, energy conservation and management in private and public sectors. Please join our community and send your comment today via Facbook, Twitter, Linkedin and the Knowledge Blog in Data Center Design! © Strategic Media Asia Limited (SMA). All Rights Reserved.